At head of title: Cuba sugar club. Cuba sugar club experimental station. Central Baragua, Cuba. by James A. Faris, chief pathologist. On Thursday, Sept. 1 3, 1928, a Hurricane, which has proved to be one of the most violent storms recorded in the West Indies, passed across Porto Rico and later across the cane fields near Lake Okeechobee, Florida, U. S. A. Since this storm crossed cane areas in both places, a study was made to secure information upon field losses, mill losses, influence of flooding by salt water and by fresh water upon the cane and stubble, and to observe any measures which might be taken to reduce field losses of both cane and plants. This report is preliminary, as complete data cannot be secured until after the present crop when we expect to be able to report upon typical fields with yield estimates which were expected had the storm not occurred, and actual tonnage and sucrose yields secured from the particular fields. We have pictures of some of these fields at various places throughout the storm zone in Porto Rico. The following statements from a report by Dr. Oliver L. Fassig, Meteorologist of the U. S. Weather Bureau at San Juan, Porto Rico, will serve to give an idea of the violence of this storm, rainfall and winds during the period of its passing, the area covered and the general storm damages in Porto Rico. "The storm broke over the southeastern portion of the Island early Thursday morning with the center near Guayama and passed across the Island in a westnorthwest direction leaving between Aguadilla and Isabela. The storm center moved across the Island in about eight hours at the rate of 1 3 miles per hour. The barometer, as the center passed to the south of San Juan at 2:30 p. in., registered the very low reading of 28.75 inches (28.81 inches reduced to sealevel). At Humacao on the east of Porto Rico a reading of 28.04 inches was recorded at 1 :50 p. m. Ponce reported 28.27 inches at 4:30 p. in. ; Arecibo on the north coast 28.74 inches at 3:30 p. in. ; Isabela on the northwest coast 27.80 inches at 9:00 p.mi. ; Mayagiiez on the west coast 28.60 inches at 8 p. mn. Guayama on the southeast coast reported the lowest barometer (27.50 inches) at 2:30 p. mn. (27.65 inches reduced to sea-level). Guayama, Cayey and Aibonito reported a period of calm or light winds lasting 20 to 30 minutes, indicating that the storm center passed over these towns. seem that the intensity of the storm remained about the same from the Lesser Antilles to Florida-a distance of about 1,700 miles (See chart No. 1). The storm center apparently kept its initial course west-north-west until it reached Florida, with an average progressive movement of 13 miles per hour, when the path turned to the northwest over Florida, then northward and no.-theastward across New York State on the 20th. 60% of the first growth canes were broken off. the coast the rainfall was generally below 10 inches. In the regions of greatest normal rainfall -the vicinity to Adjuntas in the Central Cordillera and in the Luquillo Mountains the amounts exceeded 25 inches. Adjuntas, in the central Mountain region, reported the phenomenal fall of 29.60 inches, a record which will have to be examined more carefully before being finally accepted. At San Juan the raingage was overturned before the height of the storm was reached and probably only 50 percent of the total amount which fell was recorded. It is estimated that the amount should be approximately 10.00 inches. Plate 2-Spring cane in which a high percentage of the stalks had the tops broken off during the Hurricane, Sept. 13, 1928, near Guayama, Port3 Rico. cup disappeared at 12:47 p. m. The arms and the shaft of the anemometer with one cup still attached were blown away at 1:33 p. m.; these parts were later found at San Antonio Docks, a distance of a third of a mile to the southwest of the Weather Bureau wind tower. the 4-cup anerro-eter still in use at Weather Bureau stations would have registered not less than 190 miles at San Juan on the 1 3th at the time the anemometer lost one cup. 29.30 inches, with a maximum wind velocity of 90 miles per hour at 10 a. m. of the 1 3th. The Island of St. Croix, V. I., within 10 miles of the center, suffered heavily in loss of life and damage to property and crops. "AREA OF WINDS OF HURRICANE FORCE:-Guayama, on the southeast coast of Porto Rico, was in the vortex of the storm at 2:30 p. m. of the 13th. Winds of hurricane force prevailed from 4 a. in. to 10 p. in., a period of 18 hours assuming a progressive movement of 1.3 miles per hour for the storm, the area of winds of hurricane force east and west, would be about 234 miles. At San Juan, 30 miles to the north of the vortex, hurricane winds prevailed from 4 a. in. to 4 p. m. or 12 hours. Plate 4-Gran cultura (frio) cane of variety BH 10 (12) from which a yield of 90 tons per acre was expected before the Hurricane winds. The twisting and breakage in this cane will cause considerable tonnage losses. "Winds of hurricane force were experienced throughout the Island to the north of the path; to the south some portions of the coast were apparently free from hurricane winds. The north-south extent of hurricane winds is a matter of conjecture in the absence of vessel reports either to the north or south of Porto Rico during the storm. A fact worthy of notice is that few vessel reports were received at any time during the progress of the storm, indicating that timely warnings held vessels in port or kept them away from the zone of danger. In San Juan harbor several vessels delayed sailing for 24 to 48 hours. In spite of the great intensity and great extent of the storm no reports of loss of vessels in the vicinity of Porto Rico have ben reported. "STORM DAMAGES IN PORTO Rico:-As stated above the loss of life during the storm will approximate 300. Several hundred thousand people were rendered homeless. Some towns near the center of the storm were practically leveled. The principal crops of the Island are sugar, tobacco, coffee and citrus fruits. Sugar and tobacco interests lost heavily but are generally controlled by large corporations, able to take care of themselves. The heaviest property losses were sustained by the coffee growers who had in sight one of the largest and best crops in recent years. In addition to the loss of the crop the shade trees, requiring years to replace, were largely destroyed. The citrus fruit growers lost their entire crop, but most of the trees were saved. Property and crop losses are estimated at approximately $50,000,000. Plate 5-Young cane buried by inundations near Barcelonita, Porto Rico. This cane has been uncovered and replanted. Florida, inflicting a heavy toll of life and great property losses. See chart No. I). Reports of the wreckage of the storm of September 1 3th (San Felipe) will probably confirm statements made that it was the most destructive storm on record in the West Indies. The extremely low readings of the barometer (27.50 inches) and the unparalleled intensity of the winds experienced will substantiate the claims." Path of Sept. 13, 1928 Hurricane across Porto Rico and relative location of sugar cane areas to the storm center. Arrow Vortex of Hurricane. Diagonal lines -= Area of heavy damage. Hurricane in Porto Rico was more destructive than the one which crossed Havana Province October 20, 1926. 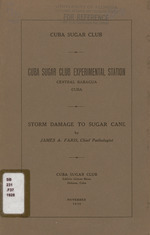 A study of the storm damage to the cane in Porto Rico was made from October 1 to 1 8, 1 928. The storm center (vortex) was slightly over 6 miles wide, judging from the calm period, which was 35 minutes maximum and the speed of the storm which was 1 3 miles per hour. From the map (Chart No. 2) may be seen the general path of this storm in Porto Rico. The shaded area in this map represents the lands planted to cane. The center of the island is rugged, mountainous land devoted to coffee, fruits and other food crops, while the narrow coastal plains and low foothills with some of the valleys make up the sugar cane areas. Plate 6-Uncovering and replanting young cane which was buried by inundations after the September 13, 1926, Hurricane. Aricebo, Porto Rico. Attention should be called to the ridge of mountains well to the south part of the island which makes up the principal water shed. The heavy rainfall during the storm flooded the lands along the north coast. The sea was carried inland along the southeast coast at several places where cane was flooded and killed out over considerable areas. The damage to the cane in the central part of this storm was far greater than anything observed in the cane after the 1 926 Hurricane whose center passed across Havana Province. In the neighborhood of Guayarna on the southeast coast of Porto Rico the spring planted cane, which was growing very rapidly and which had produced about 3 feet of stalk was badly broken off. In six fields in this zone the number of stalks from which the tops had been broken averaged 63 to 68% of all first growth shoots. A little better idea of the seriousness of this damage may be gotten from the photographs (Plates 1 and 2). The cane variety chiefly grown in this part of Porto Rico is B H 10 (12) a cane which we considered withstood the wind in the Havana storm of Oct. 1926 much better than did Cristalina cane. Plate 7-Cane 42 days under water, near the surface of the water, as shown in following photograph. In the central part of path of the September 13 storm in Porto Rico the spring cane was more seriously damaged than the gran cultura, which corresponds to our Frio cane, or the ratoon cane. As one goes either east or west from the central path of the storm the amount of breakage in the spring cane dimishes until a point is reached where the young cane could withstand the wind. From that point on spring cane was less damaged than the larger Gran cultura (Frio) cane. Late cut ratoons did not suffer so severely, as these had but 2 to 4 months of growth. Plate 8-Stalk of POJ 2 714, 42 days under water about 2 ft. deep. The roots at the surface of the water are keeping the top green. Note the lateral shoots are sprouting. When this land is drained the plants dry rapidly as the water supply from these stalk roots is cut off. impregnated with salt that considerable time will be required to leach it ouL again. After leaving the coastal plain the storm center passed over very little cane. However, the cane in valleys and on coastal areas to the east oi the storm center was very badly damaged, the wind damage depending largely upon exposure. Upon some windward slopes some plants were torn out by the roots, trash was blown away from others, leaving the bare stalks flattened against the ground. From the general appeaiance of the cane it seems that the wind destruction was less along the northwest part of Porto Rico where the storm Passed away from that island. Plate g-Cristalina cane near Canal Point, Florida from which the water was drained after 5-6 weeks inundation. This cane remained green until the water was removed, when the plants collapsed very rapidly. badly damaged that they are not expecting to grind during the coming crop and are making arrangements to grind their cane elsewhere, so that it is quite likely that in Porto Rico all cane suitable for milling will be ground this year. From the observations made upon storm damage in Porto Rico the following impressions were secured. the general storm area up, as this Hurricane maintained its violence almost unchanged to the coast of Florida. 2.-The zone of serious damage was much greater to the east of the center than to the west, a feature common to our West Indian cyclones, owing to the winds east of the center being re-inforced by the prevailing winds of the day. Owing to this feature of the storm and the exposed east coast of Porto Rico in the region of Humacao and Naguabo, the east winds passed through some of the valleys causing about as serious destruction as was observed in the vortex of the storm. 3.-Spring cane was comparatively brittle and was badly broken off throughout the central part of the storm zone. 4.-Ratoon cane, being comparatively small for the most part, suffered much less from the winds. 5.-Gran Cultura cane, being large suffered considerable losses throughcut the entire zone of Hurricane winds. It was more damaged in the outer edges of the storm than spring cane, but less damaged in the center of the storm where the spring cane was broken off. However, the fields of large cane are deceiving in appearance as many tops are green, even tho the stalks have been partly broken or so badly whipped about as to injure them so that stalk rots are beginning to cause deterioration. To estimate the losses in the crop in general for the island or for any particular mill, the percentage of each of the above classes of cane must be known as well as the location of the cane with reference to the storm and in consideration of local topography. Likewise the loss from flooding has been relativcly great north of the central divide. Guesses of 30 to 35% loss in the crop of Porto Rico are current there, and, as it was expected that the coming crop would be over 750,000 tons, this would place the present outlook at 500,000 tons. How near these guesses are to the correct output will have to remain unsettled until after the present season, but considering the sucrose loss in the cane which comes to the mill, as occurred after the 1926 Havana Hurricane, these estimates are probably none too low. From records kept by many Porto Rico planters, there seems to have been several weeks loss in growth, calculated at 15% of the crop by several mills. This in addition to the broken cane, flooded cane, and low sucrose to be expected constitute the chief damage to the present crop. The experience from the Havana storm of 1926 would indicate considerable damage to the stubble cane which would be reflected in the yields for the coming year or two. Some attempts were being made to save cane covered by mud from the floods by removing some of the soil (Plate 6). Some of the cane blown over was straightened up and the roots covered by piling soil on top of them. Arrow indicates approximate path of storm on recurve. result that the rotting of fallen cane was hastened, the lateral shoots began to grow and the losses were very high. On the other hand large cane, accustomed to a regular supply of irrigation water would suffer very badly from drought if not irrigated, so it still remains a problem whether the losses will be greater in the large cane when irrigated or not irrigated after being thrown down by Hurricane winds. The young cane began to respond very quickly to the water application. Some experiments are being carried out to determine whether it would be better to cut back the spring cane in which the tops of 60-70% of the stalks were broken off about 2-3 feet above the ground. In this cane the lateral shoots are sprouting, thus taking moisture which might be diverted to the young. rations coming from below the ground surface. If cut back the stubble would give a good crop the coming year but would not produce cane for this crop. It is a question whether much marketable cane will be harvested from some of these fields even if they are not cut back. After all is done that can be done any known relief measures foy the cane seem very inadequate and the best defensive measure is the use of canes which resist storm damage. The POJ 2725, 2714 and 2878 stood remarkably well, both in Porto Rico and Florida, and are probably among the best of the thick canes so far as wind damage is concerned. Within the past few years a new cane development has been made on the shores of lake Okeechobee in Central Florida. This region is made up of a rather deep organic muck soil, the higher phase of which are along the shores of the lake. Where this land is high enough to have been out of the water some years it supports a growth of custard apple or guava. This is the best phase of these soils and the area is largely confined to a strip from a few hundred yards to a mile wide around the shores of the lake. Further out is a broad flat area several miles in width which has been periodically under water for months at a time. This land supports a growth of coarse grass known as saw grass, and so the soil is characterized saw grass land. Some years ago the government put through several canals to the eastern seaboard of the state which have served io drain the area and lower the lake level (Chart 3). As the water was withdrawn from the muck lands the soil settled, thus making it still lower than -,he level of the lake. During 1927, 250 to 300 acres of cane were planted near Canal Point and the area was increased to about 2,500 acres the past year. The cane was making phenomenal growth and. prospects were good for a bumper crop until the Hurricanes of August and September last. Early in August a cyclonic storm passed north of Porto Rico and -north of Lake Okeechobee in Florida. While the winds from this storm did -not menace the cane near the lake, the heavy rainfall to the north which has its natural drainage outlet to the lake raised the water level to the high waw rpark. The storm of September was a much more serious matter because of this high water in the lake. The Hurricane center passed to the east of the lake, thus producing winds first from the north-northwest, changing to west-southwest. The water in the lake was driven to the south east part by the high winds and was piled up until it broke over the reinforced levees, flooding the everglade country, first to the southeast then east. Since this wind direction forced the water away from the west shore of the lake the cane development near Clewiston was not flooded. The cane fields east of the lake are separated by levees along which drainage ditches are seen which lead to the drainage canals. A field is drained by pumping the water over these levees into the canals. Comparatively few of these fields had been drained the last days of October, 6 weeks after the storm. The cane in these undrained fields had green tops and from a distance appeared to be in good condition. The water was fresh water and hence nio salt-water damage was to be expected. Some varieties of cane stand up under these aquatic conditions better than others. Several seedlings developed at the U. S. Experiment Station at Canal Point as well as M 36, Co 290, etc., were remarkable for their ability to survive this prolonged flooding. POJ 2714, 2725 and 2878 stood the wind very well but survived the 5 weeks's flooding by 18 inches of water just moderately well. Cristalina was badly killed out and B H 10 (12) and Badila, while they stood the wind fairly well, were quickly killed out by the inundation.